The Skep Chats are a hangout where the IT Skeptic rants talks about the topics that have been posted on this blog recently. You are most welcome to be part of the conversation, or as we say: please join the Skep Clan. Follow the IT Skeptic on Google+ (add me to a circle) so that you will be notified of the next Google Hangout where we record the Skep Chats. You can hangout with us and have your say. More of a lurker? No shame in that. Watch at your leisure on YouTube, or listen on SoundCloud. to keep up to date with what's new and to get exclusive discussion of topics and tirades a bit too hot for the blog. Register on this website, if you are not registered already. Check the box for "Skep Clan" under the "permissions" tab on your user account. You have joined the official Skep Clan. Skep Clan members get exclusive news and benefits. 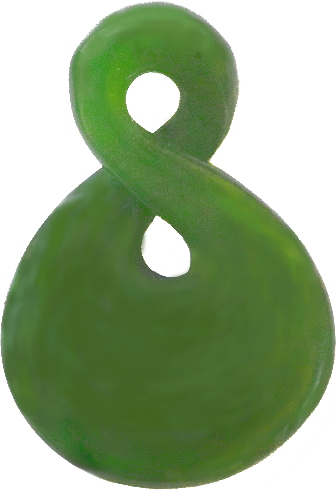 For example, all Skep Clan members in the months of March, April and May 2013 will be in the draw to receive a genuine pounamu of a pikorua - the symbol of the Skep Clan. This piece of fine New Zealand jade jewellery is something you can wear, or give to an important friend or lover. The pikorua is the symbol of a lasting relationship that endures or returns over time. Piko is the new shoot of a fern frond, symbolising life and growth, also a path or journey. Rua means two: there are two entwined pikopiko. The entwinement symbolises a relationship between two entities. They are entwined without beginning or end, symbolising eternity. With one twist in it, the pikorua symbolises eternal love or loyal friendship between two people. We're all friends in the Skep Clan. Note: Pounamu naturally varies in colour. Pounamu are hand-carved with varations in the shape. Your pounamu will differ from the picture but the basic shape will be the same. The pounamu come with a cord to wear around your neck as a pendant.